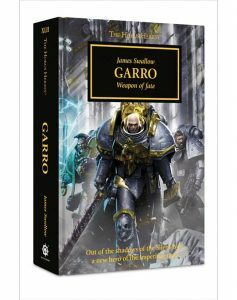 A unique release amongst the Horus Heresy book series, GARRO by James Swallow is a re-edited collection of all the audio dramas and short fictions featuring Nathaniel Garro, former captain of the Death Guard Legion, and Agentia Primus of Malcador the Sigilite. Labelled as officially the 42nd book in the series, the original Garro stories have been given an overhaul with minor additions by the author – but fear not, these are still essentially the same excellent Garro tales that we have listened to and read over the last few years. I’ve been a fan of James Swallow since his Blood Angels books, and his three Horus Heresy novels have been some of the best to grace the long-running series. Book four, The Flight of the Eisenstein, is all about Garro, charting his journey from proud Death Guard captain to unlikely rescuer, and herald of Horus’ betrayal. Book thirteen, Nemesis, is an intricately crafted spy thriller, complete with fabulous twists and turns, whilst book twenty-one, Fear to Tread, is Swallow’s epic tale of the Blood Angels Legion being lured into a trap by Horus. However, despite such a robust track record of great Horus Heresy novels, I approached the author’s hefty hardback release with a wee bit of scepticism. I expected this pseudo-collection to feel disjointed, to be no more than a cobbled together short story volume. I was therefore very pleased to discover that I could not have been more wrong, as some thought has clearly been put into this mighty tome, the myriad Garro tales having been re-sculpted with care, very subtle additions throughout adding character and atmosphere. The release schedule of the original audio tales was sporadic, and the first two were released out of order, but thankfully we now have a comprehensive and immersive odyssey of Garro’s exploits, from his initial recruitment by Malcador and his subsequent mission to Calth (from ‘Oath of Moment’; worth noting that this collection does not use or reference any of the original release titles), to locating the lost Garviel Loken, uncovering treachery amongst a fleet of refugee ships, to discovering a secret base that may hold a clue to Garro’s destiny, and battling his own doubts to track down Euphrati Keeler, the ‘living saint’ Garro rescued aboard the Eisenstein, saving her from an obsessed killer (a very smart cameo from a character seen in one of Swallow’s other Horus Heresy titles). Garro is a man of conviction and duty and in the early chapters of the book he is initially possessed of righteous purpose, glad to feel of some use after a lengthy spell under watch in the Somnus Citadel. As the book progresses, and Garro’s missions lead him to unexpected corners of the galaxy, near and far, his conviction begins to waver, as his faith and code of honour lead him to question his role as the sigilite’s Agentia Primus. Author Swallow sells this change in Garro’s nature very convincingly and brings a complex dimension to a character who might otherwise have been predictable in his moral piety. I get the sense that James Swallow has more tales in store for Garro, and regardless of whether they are audio or prose (Garro surely deserves his own outright novel), they are eagerly awaited. Andrew is the award-nominated author of steampunk fantasy novels, The Vengeance Path, and its sequel, Children of War, both available from the Amazon Kindle Store.